A post on mung beans has been long overdue. Puja and I have been talking about doing a post on them ever since we first started this blog. Much like lentils, they can be used in so many different ways. Well, I’ve sort of been on this Sisyphus diet of losing a couple of pounds and gaining it back a day or two later. 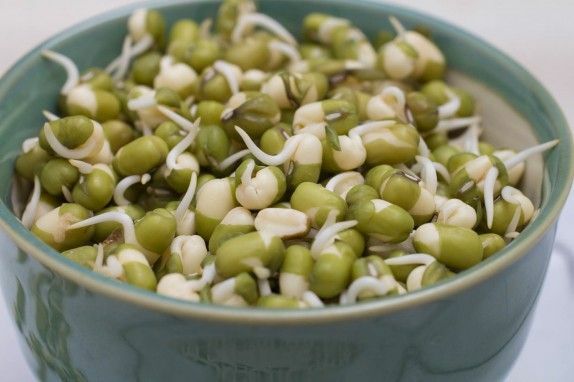 So I’ve been trying to think of different foods I could eat that might help me break through the rut and mung bean sprouts popped in my head. They make a great snack raw, like popcorn with substance. They have a freshness and a bit of sweetness that makes them addictive. They also saute really well for an easy meal. It would be very nice and convenient to have a big bowl of them in the fridge to use when I feel like it, too bad we only had a cup of beans left that I used for this recipe. I’ll be making them again as soon as I get to the store to buy more. Sprouting is a kitchen technique you don’t see much in the U.S. but is common in Indian cooking. 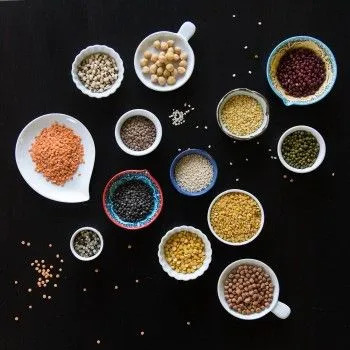 You can sprout lentils and many beans, such as brown garbanzo beans. It’s one way to get them soft enough to eat without having to lug out the pressure cooker. 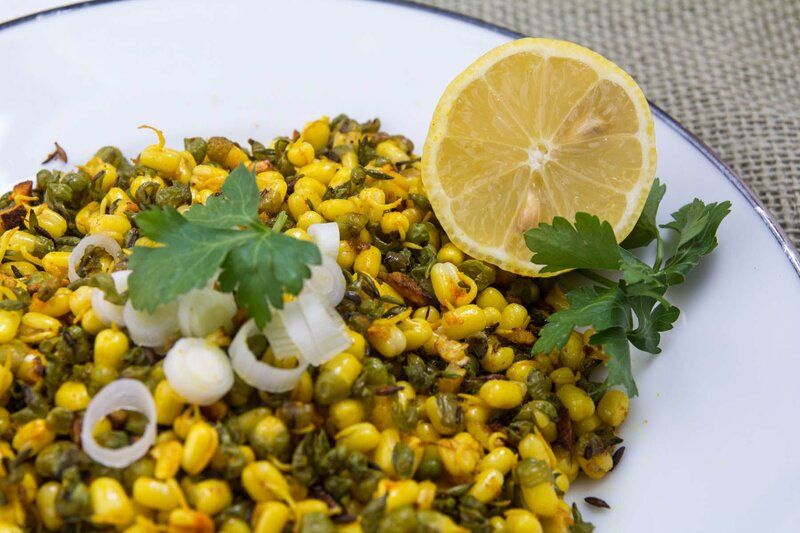 For Puja, sauteed mung beans were a staple breakfast of her childhood. Sprouts are also popular these days among the health food crowd because it brings out the nutrients in the bean and helps with digestion. 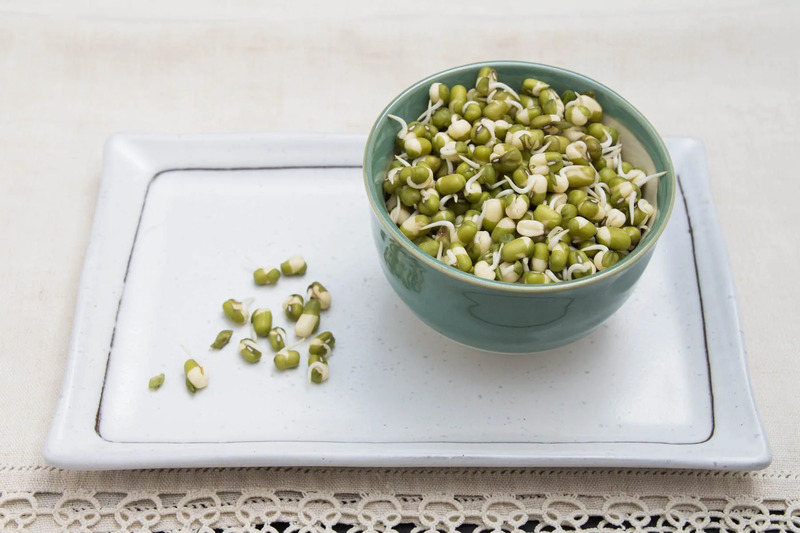 Mung bean sprouts are the same sprouts you find in many Chinese and Thai dishes, but we don’t allow them to grow as much, so they are smaller and the bean is left more intact. The result is almost a completely different food. Perform vaghar: heat the oil in the pan, when it is hot enough, add the cumin. You will know it is hot enough because when you drop in one cumin seed tiny bubbles fizzle around it. Let the cumin toast in the pan for about 10 seconds, until you smell the toastiness, but don’t burn the seeds. Add the garlic and stir a bit. When the garlic is a little brown, throw in the mung beans and add remaining ingredients. Saute for about a minute or so, just to brown it a bit and let the flavors develop. For a softer, less crunchy saute, add a couple of tablespoons of water, cover and let cook about 5 minutes. I would encourage you to throw in anything else you might want in this dish. Add some onions with the garlic if you want, some chilies or maybe some ginger, it’s a very flexible dish. In the pictures we topped the beans with spring onions and a little parsley. Why not? Cilantro would be great in this too! Put the 1 cup of dry mung beans in a bowl, cover with at least 2 cups water, if not more. The beans will double in size, you do not want any to escape the water as they expand. Let soak for about 4 hours. Drain the water from the beans. Wrap them in a paper towel, or tea towel. 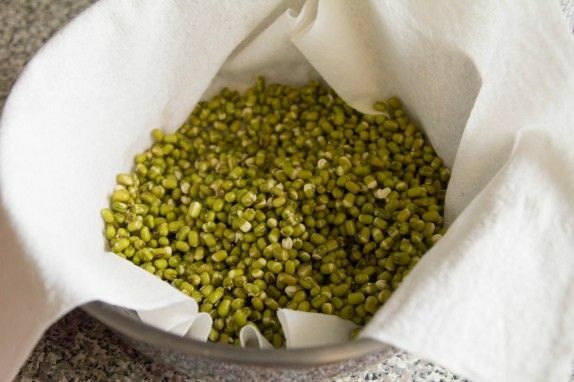 There should be enough water left on the beans to dampen the paper towel, if not, you may dampen the towel a bit. Place in a colander in a bowl, cover with a dark towel or plate so they are not exposed to light. Allow them to sit overnight or for at least eight hours until they are sprouted to the extent that you like. You can let them keep growing, but if you wait too long they tend to mold. 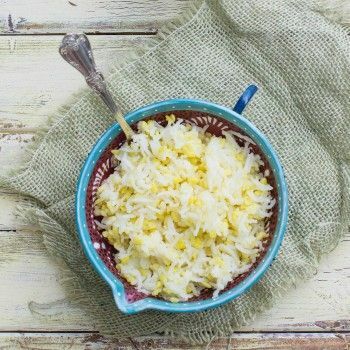 Perform vaghar: heat the oil in the pan, when it is hot enough, add the cumin. You will know it is hot enough because when you drop in one cumin seed tiny bubbles fizzle around it. Let the cumin toast in the pan for about 10 seconds, until you smell the toastiness, but don’t burn the seeds. Add the garlic and stir a bit. When the garlic is a little brown, throw in the mung beans and add remaining ingredients. Saute for about a minute or so, just to brown it a bit and let the flavors develop. 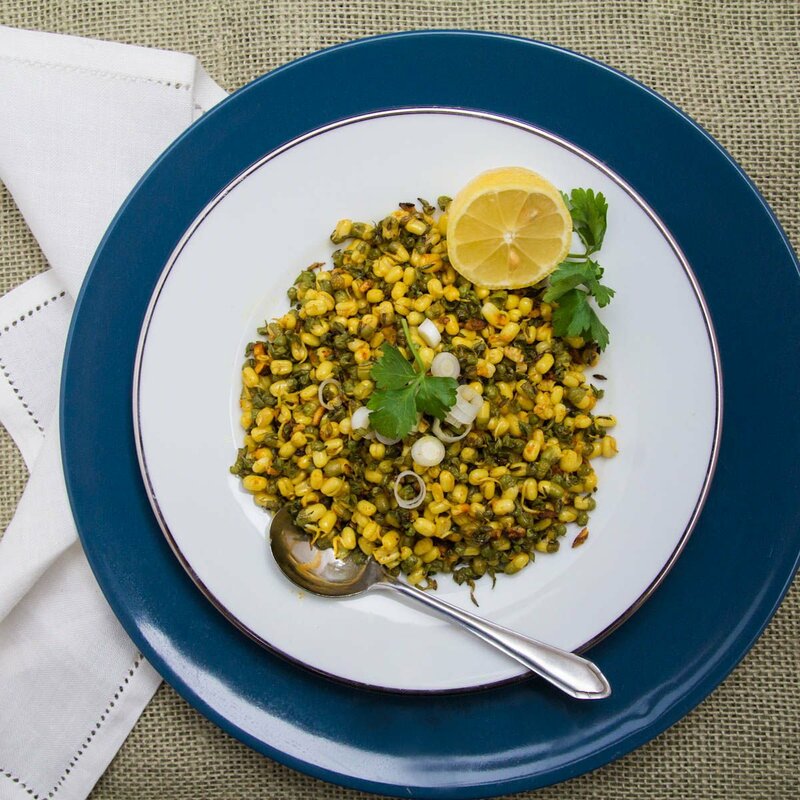 Comments on "A Healthy Snack and Meal: Sprouted Mung Beans and a Simple Saute"
What a wonderful post! 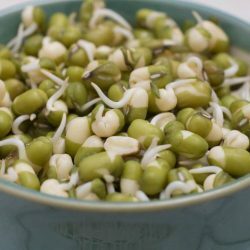 I love sprouts, and especially Arne is growing them regularly, and his favourite ones are mung beans. He will definitely love your sauté recipe, and I am sure I will, too. 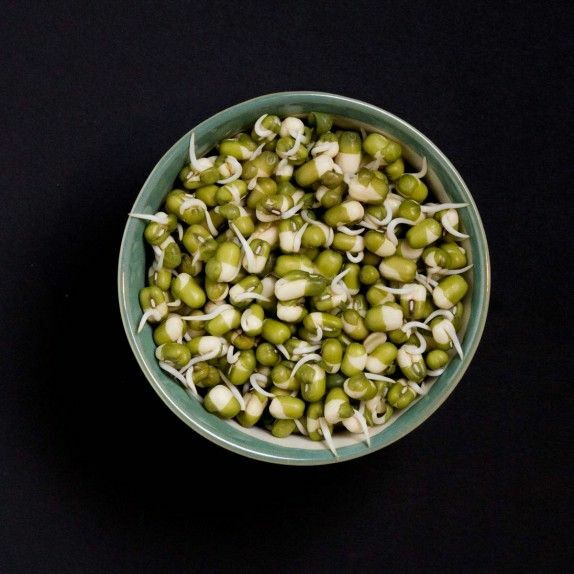 I admit that mung bean sprouts have not been my favourite sprouts so far (I love most mustard seed sprouts), but your dish looks so very delish that I will just have to try it. Thanks for the inspiration! Thank you, Claudia! I'm going to have to try some other sprouts. What do you do with the mustard sprouts? I'm going to have to ask Puja if she's got any recipes for those. Indians do a lot with mustard seeds and with sprouts, I bet there's something. 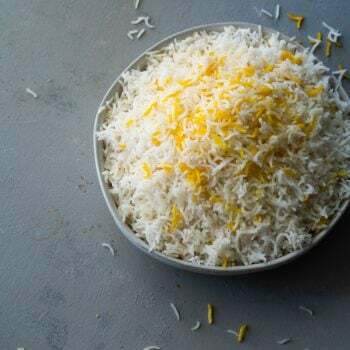 To be honest: We usually don't do anything special with mustard sprouts, we just add them to some sandwich filling or as a topping on salad because of their nice sharp taste and crisp texture. They also match very well with everything that contains fruits (for example a curry with tofu and mango). I am sure that Puja has some great ideas how to use them best! I asked Puja and it turned into a whole discussion between her and her mom. 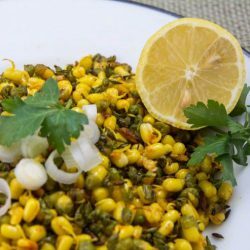 Mustard sprouts are used a lot in north Indian cooking. Hopefully we'll do a post on that pretty soon, she recommended a dish with garbanzo bean and mustard sprouts. 1. A cupful in a bowl under the hot tap water to clean them (I use a transparent glass bowl). 2. Let hot tap water (do not use boiled water) be two inches above the beans. 3. 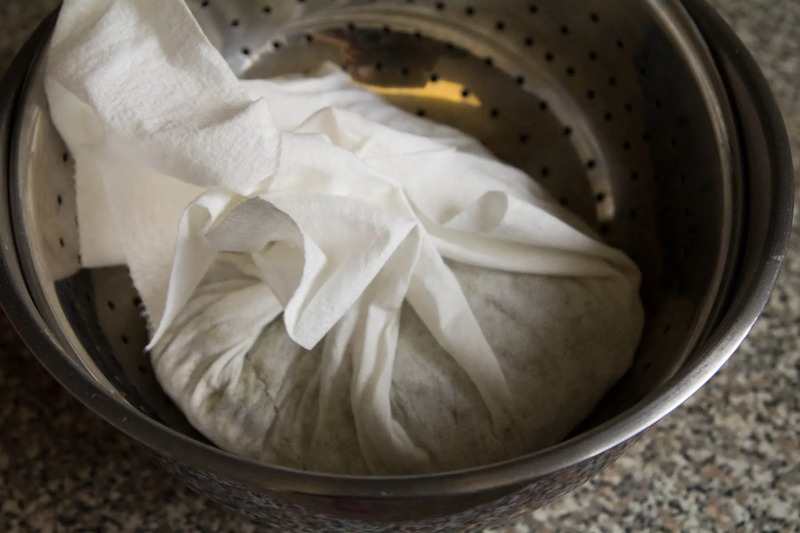 Cover it with a lid and let is soak for four hours until they become tender..
4. Drain the water( sine it has few nutrients, either save it for future soup or to mix it with rice or discard it). 5. Put the lid back on. In 12 hours they will sprout fabulously. We used to eat sprouts a lot in my childhood but stopped for some reason. In any case, my family's been trying to eat healthier so we incorporated this with our veggie intake. 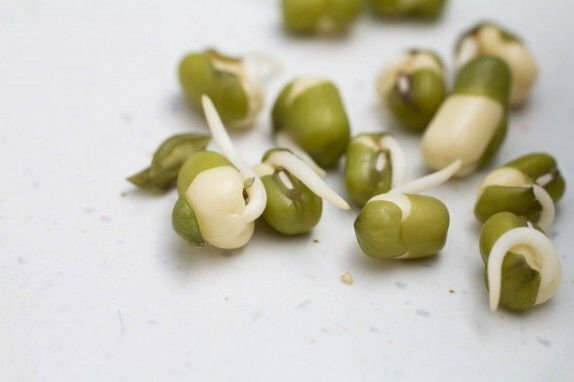 i just have a question since mine did not turn out - the recipe calls for 1 cup of beans which double in size when sprouted, but then one cup of the sprouted beans - will the other 1 cup of sprouted beans be left over? thanks. Also there were some really hard beans left that needed to be picked out. Hi AS, thanks for trying the recipe. Sorry if it wasn't clear but I intended the instructions for sprouting as separate from the saute because when you sprout beans it's nice to make a whole lot of extras for different uses. I'll sprout a big batch and use some for a saute, some just to snack on with a little salt and maybe some lemon, and some just to throw in random dishes, so this is why the quantities don't match up. There should definitely be some leftover. I'm sorry you had some hard beans. That'll happen if your beans are getting old, were stored poorly at some point in time, or it could be you needed to germinate them longer if there were a lot of these. The weather has a big effect on how long they take to sprout. I hope you make these again and let me know how it goes! Added lots of fresh ginger, some fresh turmeric root and green chilies - it was lovely! I like the crunchiness of the sprouted beans - unexpected and refreshing! Thanks Catherine. The crunch really is wonderful! 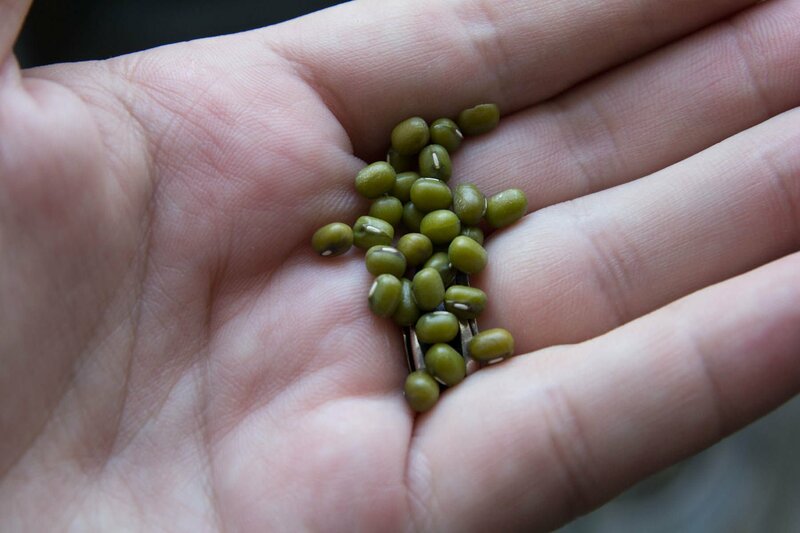 I love snacking on sprouted mung beans with a little squeeze of lemon juice and a pinch of salt. Mine have been sitting for about 20 hours and don't look very sprouted - only a few show the white thread sticking out but none have popped out. I used a colander and a dish towel while sitting, could that be why? What is needed to salvage them so they don't get moldy while I'm waiting? Thanks in advance! Hi Suzanne, it sounds like your sprouts are doing exactly what they should. You could take them out, rinse them and return them to the colander/towel set up if you are worried about mold. The ones seen in the post were probably sprouted a little over two days to get that much sprouting. I have a sprouting jar and the instructions are to (after soaking and draining) to leave for 4 days rinsing and draining every 8 hours or so. Nothing about covering to keep the light out. Your way seems much easier. Am I missing something? What is the periodic rinsing meant to do?